Investing in a new opener is an excellent way to improve the security and convenience of your overall property. However, there are many different models to choose from, and few homeowners are familiar with the benefits and drawbacks of different systems. We’ve been helping homeowners in your area to upgrade their garage doors for years, so here is our quick guide to get you started. How Strong Should My Opener Be? The heavier your door is, the stronger the opener will need to be. Typically, most single-width garage doors made from steel only require about a ½ horsepower drive system. This is more than enough to lift the load comfortably, with enough spare power to ensure a long service life. If your door is particularly small or made from light materials, such as plastic, then a ¼ HP engine might be enough (though we recommend checking with our technicians first). Similarly, double-width doors and those made from heavy materials (such as real wood) often require a stronger motor, up to ¾ or 1 HP. What Drive System Should I Choose? Openers use a variety of different drive systems to connect with the door. Chain drives are the most familiar, and are a reliable and affordable option. They make a lot of noise, though, so many people choose belt drives instead - these are far quieter, though can be more expensive. Screw drives are a relatively recent addition to the market, and combine reduced noise during operation with a much lower maintenance requirement. Should I Choose Additional Features? Much like many other areas of home technology, garage door openers have been fitted with 'smart' systems by manufacturers. These can improve convenience significantly – for example, the Chamberlain “MyQ” app allows you to control your opener from your phone. They can improve security too, e.g. rolling code technology works by generating a new remote code each time your door is opened. This helps to prevent thieves from duplicating your code and gaining entry. Our team can explain the advantages of any new smart technology feature in more detail. Our aim is to ensure you've got all the knowledge to choose the perfect unit for your home. 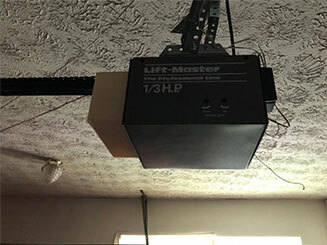 If you’re looking to upgrade your garage door opener, Garage Door Repair West Saint Paul can also help you with this project, from start to finish.